Walking shoes laced tight, I stand at the bottom of the fog-topped hill. Already I’m weary and I haven’t yet begun the climb. With a sigh, I put one foot in front of the other and I’m on my way to the top. Halfway up, I find myself breathless with calves and knees complaining, but I’m determined. I must be ready for the race in two weeks, and the hill I will face there is twice as large, twice as steep. A few feet more and doubts start to creep in about my abilities, about my body’s abilities. And then I remember that persevering isn’t just for the spiritual realm but for this physical world, too, for my straining muscles and my apathetic mindset. If I look too far ahead, I see only the fog stretching before me, creating the illusion that the hill stretches on forever. It will never end, I hear the voice in my mind and it grows louder with each step. This weight battle will never end for you. You might as well just give up now. Did you really think you could do this? Do you really believe you will succeed? 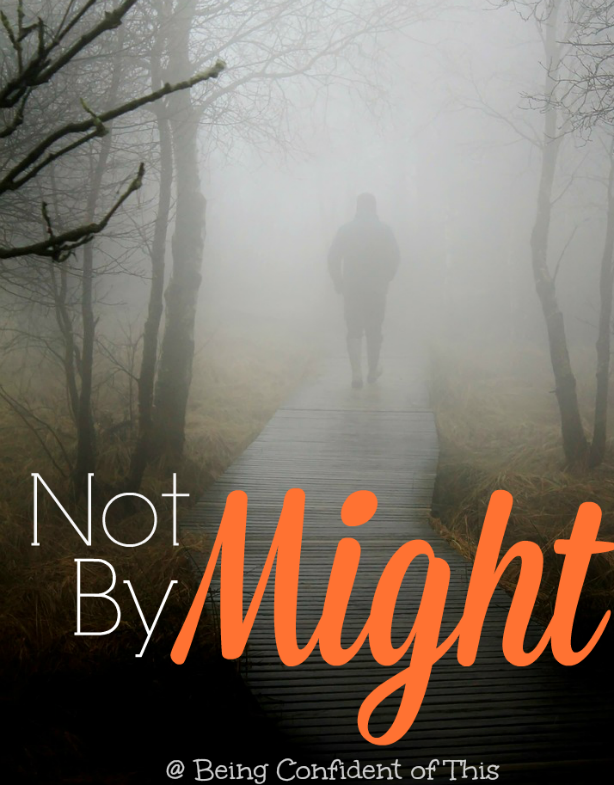 I can listen to my cramping muscles and the voice of that snake, the Enemy, or I can buckle down with God-dependent effort, determined to persevere even in this as long as the Lord allows it. It’s the story of my life, really: keep fighting or give up. Is there any middle ground between the two? And another voice echos in my mind. Greater things not just for this city but for you, Daughter. You will reach the top. By my power, you will see success. With My strength, you will persevere. You CAN do this. And greater things will come, but you must fight for it. You must fight the whispers of the Enemy and the desires of the flesh. You must learn to lean on Me, even in this. I will give you the power to persevere. The fog clears as I near the top and my strength is renewed. When I round the corner and the incline levels off, I feel a sense of relief, but I also want it to be over. I long for rest. However, the walk isn’t finished yet. In fact, it’s only just begun. I keep plodding ahead, one foot after the other, asking the Father’s glory to be revealed in even this small thing, asking for knees that bend without pain and breath that comes easier. A few blocks later, I realize I’ve come full circle to face the hill again. But this time, I have faith. I know I can do it because I’ve done it before, with His help. And no matter how much my body protests, I drag it up the hill once more. It strikes me then, the connection between the spiritual and the physical. How I often run straight to complaining when I face “hills” in life. I start out grumbling and already thinking about giving up. Believing I might be able to “power through” until the trial is over if I could just see the finish line, I search the foggy path ahead, eyes straining to see through to the end. But the end is not for me to see. What I am given is just a few feet ahead of me. As long as I focus on those few feet in front of me, I remain strong, but when I look ahead to the stretched out future, my resolve falters. It’s then that I turn to the Father. I’m reminded of the prophet Zechariah, faced with the task of encouraging the Jews to rebuild the temple and re-establish themselves in Jerusalem. They faced many obstacles and nay-sayers, as well. In fact, they were just the remnant of the Jews who lived there before, only a few compared to the former. In this passage, Zechariah experiences a vision. Through this vision, the Lord Almighty reminds the prophet that the work needing done would happen not by human strength, but by the power of His own hand. He also promised to give the remnant the power necessary to complete the construction of the temple. Even more than that, He reminded Zechariah of His almighty power to remove any obstacles (mountains) that might get in the way of completion. My friends, we will face many hills in life, and mountains will stand in our way. Often, we’ll be tempted to quit before we’ve even really begun. The power to persevere on our own quickly walks out the door when the going gets gruesome. 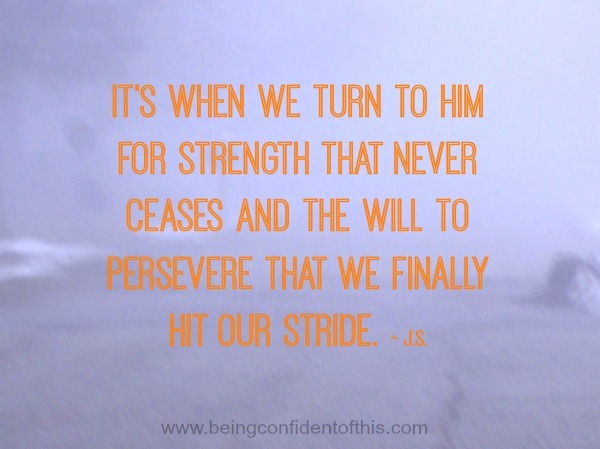 It’s when we turn to Him for strength that never ceases and the will to persevere that we finally hit our stride. Keeping in mind that He delights in even the small things, small acts of obedience, small steps up a great hill, we cling to that power to persevere. Even more, those hills that we face can feel like level ground in grip of His grace.